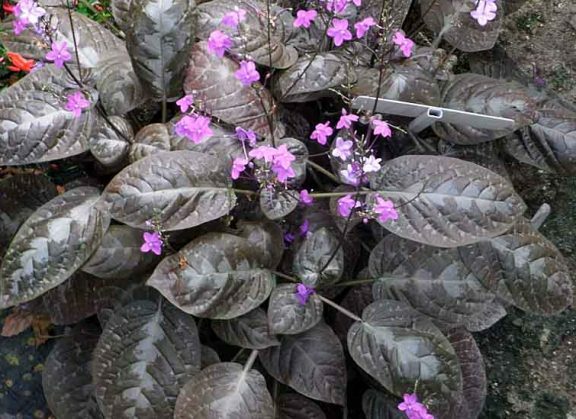 Chocolate Plant is common name of Pseuderanthemum alatum, which is a low-growing shrub from the family of popular tropical plants like Ruellia and Odontonema. Chocolate Plant takes its name from coppery-brown colors of its foliage. Pseuderanthemum alatum is usually grown as ground cover in tropical climates where it grows under full to partial sun. In colder climates, it can be grown in greenhouse. The plant requires rich, well-drained soil and regular watering though it is capable of surviving occasional droughts. Pseuderanthemum alatum is usually propagated from cuttings. The plant grows up to 1 foot and bears purple or magenta flowers. The beautiful foliage of Chocolate Plant makes it an attractive plant for landscapes and gardens where it can be grown to fill large spaces or cover uncultivated ground. It can also be grown along borders to add dramatic colors to the garden.